STAMFORD — A downtown office building has sold for approximately $18.2 million, in one of the city’s largest sales of the past year. Tenants include ground-floor offices of H&R Block and Stamford Bank & Trust, with several law firms and other corporate offices on the upper floors. Six Hundred Summer’s sale produced about $227,000 in state conveyance taxes. The seven-story structure, which was built in 1970, was appraised for about $15.5 million in 2017, according to the Vision Appraisal property database. Forstone made about $1.4 million worth of renovations to the property. They included new elevator lobbies and bathrooms on each floor, new signage, a new glass awning and entranceway and improvements to the main lobby, parking lot and mechanical equipment. 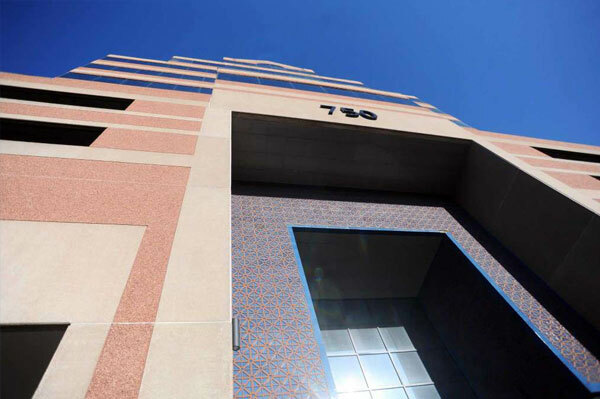 In Stamford, Forstone also owns office blocks at 750 E. Main St., and 9 W. Broad St. Forstone bought the former property for approximately $8.1 million in 2016 and the latter, in a joint venture with Westport Capital Partners, for $14.5 million in 2013. It has since undertaken major renovations at the two buildings, which were both nearly empty when Forstone acquired them. Today, leasing levels run at about 90 percent at 9 W. Broad and around 80 percent at 750 E. Main. Among other downtown building sales in recent months, the site of the Stamford Marriott hotel sold for about $32 million and a two-building complex at 1111-1117 Summer St., went for $12.4 million. The approximately $130 million sale last November of a Greenwich office campus at 100 W. Putnam Ave., marked the area’s largest property transfer of 2018. Beauty and wellness company PDC Brands is relocating its headquarters within Stamford, signing a lease for 26,500 square feet in the office block at 750 E. Main St., on the edge of the downtown. Now based in the High Ridge Park office complex off Merritt Parkway’s Exit 35, PDC is scheduled to move into its new space in the second quarter of 2019. It will be the largest tenant in the approximately 100,000-square-foot building, which is now 76 percent leased. Messages left for PDC were not returned. Commercial real estate firm Newmark Knight Frank represented PDC in leasing negotiations. 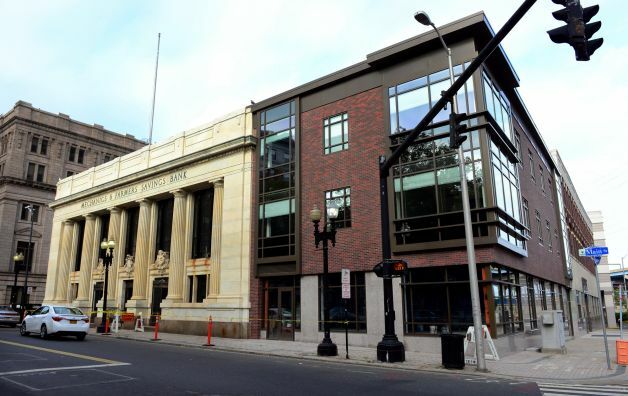 “The modern space in the building and proximity to downtown Stamford make this an ideal choice for PDC,” NKF Senior Managing Director Tim Rorick said in a statement. When Forstone acquired the building for $8.1 million in November 2016, it stood idle, except for one tenant taking about 5,000 square feet. A number of departures in recent years had emptied the reddish-hued building, which stands yards from a Sheraton hotel and the sprawling office complex at 695 E. Main St.-200 Elm St.
Last year, Forstone undertook approximately $.15 million of renovations on the 10-floor building, which dates to 1986. The work includes a redesigned main entrance, with a new driveway and plaza; a refurbished main lobby; a new full-service cafeteria; a remodeled fitness center; and new board and game rooms. Today, the building is leased to nine tenants, which take an average of about 9,000 square feet. Among the tenants, Office Evolution, a national co-working firm, opened in May an approximately 10,000-square-foot center on the building’s sixth floor. It includes 34 private and furnished offices and several conference rooms. 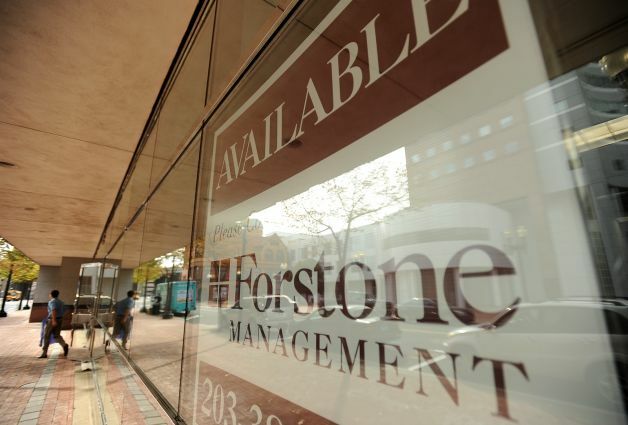 Forstone officials have said they aim to reach an 85 percent leasing rate at 750 E. Main by the end of 2019. That usage level would rival the occupancy at 9 W. Broad St., which Forstone and Westport Capital Partners bought in 2013 for $14.5 million. The two firms invested more than $20 million in renovations to revive a property that, like 750 East Main, stood almost entirely vacant when it was bought. Forstone also owns an office building at 600 Summer St., which it acquired in 2015 for $10.65 million. Jeffrey Dunne, David Gavin and Travis Langer of CBRE's National Retail Partners represented the owner, CapFor Westport, LLC, in the sale of 1365 Post Road East (Route 1) in Westport, Connecticut. The team was also responsible for procuring the purchaser. 1365 Post Road East is a 50,795± SF grocery anchored center prominently situated on Route 1 (22,100 cars per day), the main retail corridor in prestigious Westport, Connecticut. The property is 95% leased and is anchored by Balducci's, a gourmet grocer, and Ulta, who is currently building out their space and expected to open in March. Additional tenants at the property include Tusk Home, W Hair & Color, Zaniac and Awareness Technologies, collectively providing an average remaining lease term over nine years. The Property's diverse and complementary tenant mix caters to the affluence of the Westport market, which boasts average household incomes over $245,000 and average housing values over $1 million. Mr. Dunne commented: "1365 Post Road provided a rare opportunity to purchase a grocery anchored center in the highly site constrained and prestigious Westport market. We expect the purchaser will fare well with the acquisition due to its strong rent roll, easily accessible Route 1 location and surrounding demographics that support high sales volumes." STAMFORD — Six Financial Information USA, a data provider for the asset-management industry, is relocating its offices in the city from Springdale to the downtown, Hearst Connecticut Media has learned. The firm will take approximately 13,300 square feet in the office building at 9 W. Broad St. Its local offices are currently based in the 3 building, on One Omega Drive, in the River Bend Center office park. Six Financial also maintains offices in Manhattan, Boston and San Francisco. Officials of Six Financial were not immediately available for comment. 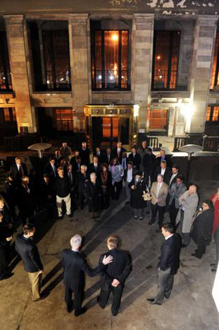 The arrival marks the latest phase in an ongoing revival of the approximately 200,000-square-foot 9 W. Broad St. building, which languished nearly empty before its acquisition four years ago by its current owners, Darien-based Forstone Capital and Wilton-based Westport Capital Partners. Renovations worth more than $20 million and active recruiting by real-estate firm Rhys have since propelled the property to an occupancy rate of more than 80 percent. Among other recent arrivals, real estate investment firm Waypoint Residential moved in July to renovated offices covering 11,500 square feet on the eighth floor. Using 9 W. Broad as a model, Forstone is finishing up renovations of an 100,000-square-foot office building it owns at the other end of the downtown, at 750 E. Main St. Like 9 West Broad, 750 East Main also stood mostly vacant when it was purchased by Forstone last year for about $8 million. A year later, signed tenants combine for about 35,000 square feet. “What we’ve had success with in Stamford is buying it at the right basis, which allows you to improve the building, reposition it and create a first-class building, fully amenitized, but still offer value rents,” said Forstone Principal Brandon Hall. 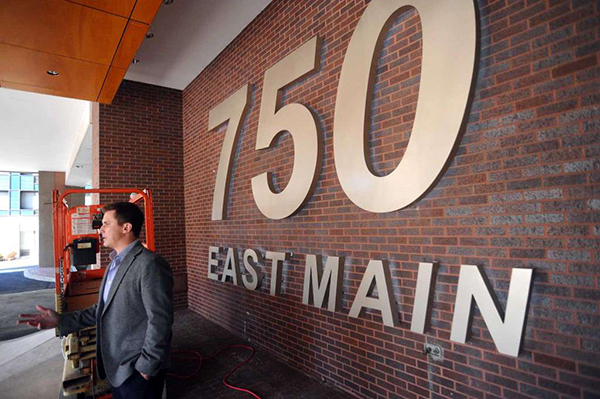 Approximately 35,000 square feet of new leases have been signed to a variety of tenants at the newly upgraded office building at 750 E. Main St. in Stamford, according to owner Forstone Capital LLC. Most of the activity has been centered on two tenants, Rollease Acmeda Inc. and Office Evolution, both of whom are expected to move in early next year. Represented by Budd Wiesenberg and Bob Caruso of CBRE, Rollease Acmeda’s new corporate office and showroom will be on the seventh floor, totaling approximately 18,000 square feet. Formerly at 200 Harvard Ave. in Stamford, the company designs and manufactures window covering hardware, automated shades and machinery for use in both commercial and residential applications. Office Evolution, a national franchise offering co-working spaces, conference rooms, virtual office services and fully furnished offices and suites, will be on the sixth floor of the building, occupying approximately 10,000 square feet. It was represented by Craig Ruoff of Cushman & Wakefield of Connecticut. Designed by Beinfield Architecture, the building’s renovations include a new main entrance and vehicle access/circulation, a fully redesigned main lobby, and a modernized amenity package such as a cafeteria, updated fitness center and locker rooms, and new private board and game rooms. 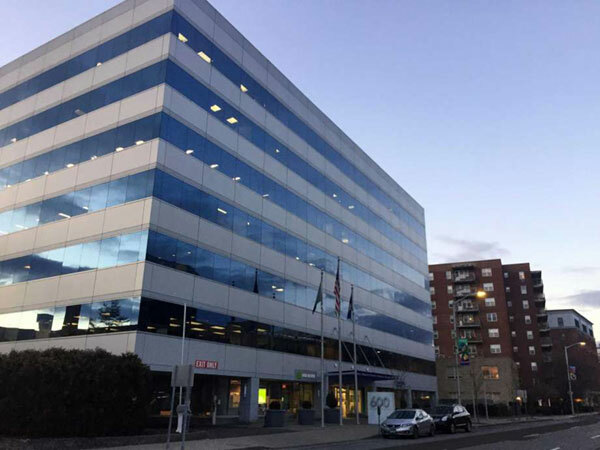 Across the street from the BLT Financial Centre at 200 Elm St., the building also offers tenants access to a dedicated shuttle to and from the city’s transportation center and to more than 300 covered parking spaces. Additionally, on-site security personnel and property management is provided. STAMFORD — In the four past years, Forstone Capital has filled its once-vacant office building at 9 W. Broad St. Now, it wants to accomplish the same feat with an office complex on the other side of the downtown. After buying 750 E. Main St. in November 2016 for $8.1 million, the Darien-based real estate investment firm has implemented the strategy that spurred the revival of 9 West Broad: extensive renovations and robust marketing. The plan has quickly reaped dividends at 750 East Main, as new tenants have combined to lease about one-third of the approximately 100,000-square-foot structure. When Forstone bought the property, it languished with total vacancy, aside from one tenant taking about 5,000 square feet. A series of departures in recent years had emptied the building, which sports a reddish exterior and stands yards from a Sheraton hotel and the sprawling BLT Financial Centre office hub. Top-to-bottom renovations, worth about $1.5 million, are nearly complete on the 10-floor building, which dates to 1986. The months of work encompass a redesigned main entrance, with a new driveway and plaza; a refurbished main lobby; a new full-service cafeteria; a remodeled fitness center; and new board and game rooms. So far, Forstone has signed approximately 35,000 square feet of leases. The new tenants are taking offices from 2,500 square feet to 18,000 square feet. Rollease Acmeda — which designs and manufactures window-covering hardware, automated shades and machinery — is set to become the building’s largest tenant in the first quarter of 2018. It has signed a lease to take some 18,000 square feet for corporate offices and a showroom, which would cover the entire seventh floor. Office Evolution, a national office-services firm, will take about 10,000 square feet on the sixth floor. It is also scheduled to arrive within the next few months. Forstone aims to reach an 85 percent leasing rate by the end of 2019. That level would roughly equal the occupancy at 9 W. Broad St., which Forstone and Westport Capital Partners bought in 2013 for $14.5 million. The two firms invested more than $20 million in renovations to revive a property that, like 750 East Main, stood almost entirely vacant when it was bought. “What we’ve had success with in Stamford is buying it at the right basis, which allows you to improve the building, reposition it and create a first-class building, fully amenitized, but still offer value rents,” Hall said. The city’s persistently high office vacancy rate — hovering around 30 percent — does not necessarily intensify competition among 750 East Main and other office properties with large blocks of available space, Forstone officials said. They are generally recruiting tenants with much smaller footprints than their neighbor, the BLT Financial Centre, which has two occupants, Deloitte and Henkel, each taking more than 100,000 square feet. “Between 3,000 and 10,000 square feet, there’s a lot of activity in Stamford right now,” said Scott Raasch, Forstone business development director. Almost 10 years after the property changed hands, apartments in a State Street building overlooking McLevy Green in the heart of downtown Bridgeport are almost ready for occupancy. The McLevy Square development by Darien-based Forstone Capital will bring new residents to the neighborhood and, just as importantly, give them something to do, with a comedy club and beer hall looking to begin operations in the coming months. The $18 million project features 32 one- and two-bedroom units, each one distinct in layout or other details. Many overlook McLevy Green, with oversize windows allowing for plenty of natural light. Each unit includes a washer and dryer, air conditioning and dishwasher along with granite countertops. Twenty-five of the 32 units qualify as affordable housing with restricted income guidelines. Rents in all units will range from $1,200 to $1,600 per month. The development included public financing from the state Department of Housing as well as the Department of Economic and Community Development and historic tax credits. Private financing came from M&T Bank. Nick Lundgren, deputy commissioner of the Department of Housing, said the agency has made great strides in adding affordable units around the state, citing $1 billion in public money going toward 21,000 homes. He cited the potential for “transformative impact” in a place like Bridgeport. “We need to create vibrant, inclusive communities where people want to live, work and invest,” he said. The Stress Factory Comedy Club at 167 State St., in the former Playhouse on the Green space, joins another location in New Jersey, which has attracted well-known comedians over the past 20 years. Harlan Haus, a German-style beer hall in the former People’s Bank building at 155 State St., will incorporate many of the historic bank attributes into the restaurant. Its owner also runs Harlan Social in Stamford and Harlan Publick in Norwalk. The development includes three other retail spaces, one of which will become Forstone’s property management office. The Backstroke, which formerly occupied one of the spaces before moving around the corner during construction, could return. Forstone also redeveloped the former Mechanics and Farmers Bank building on McLevy Green, occupied until earlier this year by the architectural firm Fletcher Thompson. Forstone said other parties have expressed interest in the location as office space. Real estate investors from Connecticut are expanding outside state lines for the first time, making an initial investment in Nashville that they hope will tee up a regional office for their firm. Forstone Capital LLC paid $13.3 million for the Oaks Business Center, which offers more than 60,000 square feet of office space in the 100 Oaks/Berry Hill area, immediately south of downtown. This is the 10-year-old firm's first investment outside of its home state, and co-founder Brett Wilderman said there's more to come — establishing Forstone as the latest in a slew of newcomer, out-of-state ( or even overseas) real estate investors swarming Nashville during its boom. Often, those investors have been willing to pay a premium to break into the market, increasing competition for property and enabling property owners to command higher prices for their holdings. "We are absolutely interested and plan on future investments in the Nashville metro area," Wilderman wrote in an email. "Our goal is to continue to invest in the market and eventually establish a regional office in Nashville. Historically, we've invested in Connecticut, but we're looking to diversify outside the market in mid-size cities with attractive growth fundamentals. Nashville hit on all marks." 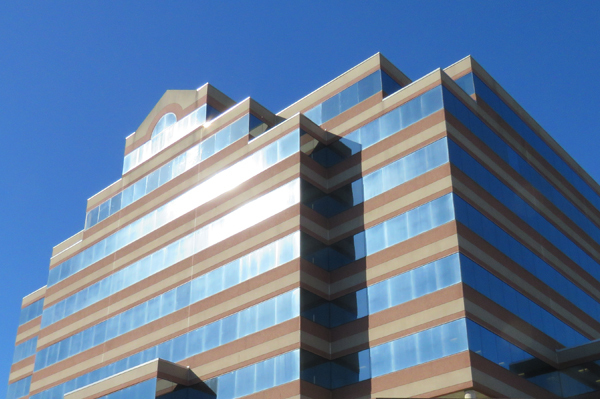 Forstone bought the two-building office property from Nashville-based Priam Ventures. Forstone paid Priam $1.8 million more than what Priam paid for the property two years ago. The sale of the Oaks Business Center underscores the shift Priam Ventures is making as the kind of deals they seek locally are vanishing. The 7-year-old investment firm once had holdings in Germantown, Sylvan Park and elsewhere in Nashville. After shedding the Oaks Business Center, Priam owns just one local building, at 9005 Overlook Blvd. in Brentwood. It's now on the market, listed with brokerage firm CBRE Group Inc., which Priam also retained to market the Oaks Business Center. "We have capital to deploy. Right now, we're focused on other markets with attractive deals," said Brian Adams, a principal in Priam Ventures. As examples, Adams cited a Memphis property purchase earlier this year, and he said he's a couple of weeks from closing a deal in Indianapolis. Ulta Beauty is leasing the former Anthropologie store at 1365 Post Rd. East in Westport, following the latter retailer’s opening its new Anthropologie & Co. store earlier this year at the Bedford Square development in downtown Westport. Ulta Beauty sells a wide range of cosmetics and salon brands. The Westport opening will be Ulta’s fourth in southwestern Connecticut after locations in Danbury, Norwalk and Milford. The company is on track to open 100 new stores this year. 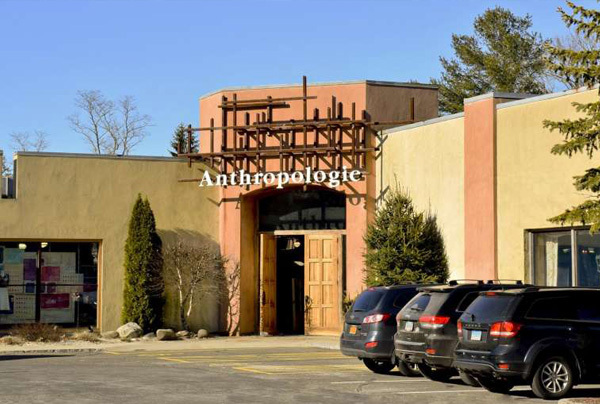 The Anthropologie building is owned by Darien-based Forstone Capital which was represented by Newmark Knight Frank in the transaction, and True Commercial Real Estate representing Ulta Beauty. The windows may be boarded up now, but once the new glass panes are installed on the front-facing apartments in the buildings now under renovation on State Street, residents will have among the best views downtown. Overlooking McLevy Green, the structure at 177 State St. will provide skybox-style seats to the annual Downtown Thursdays concerts in the summer and stunning views of the holiday lights and snow-covered green in the winter. Forstone will begin accepting applications for the 32 apartments — a mix of studios, one- and two-bedroom units — next month. Wilderman said he hopes tenants can begin occupying the units, 25 of which are affordable apartments with restricted income guidelines, in late August. Rents will range from $1,200 for the smaller one-bedroom units to $1,600 for the larger two-bedroom units. The following month, the German beer hall, Harlan Haus, will open in the former People’s Bank building, which also housed Roberto’s Restaurant for nearly two decades. Harlan Haus, which has already established a presence on Facebook, is the brainchild of Stephen Lewandowski, owner of Harlan Social in Stamford and Harlan Publick in Norwalk. In October, the Stress Factory Comedy Club is expected to open, as well, in the former home of the Playhouse on the Green. The club will be owned by Vinny Brand, who also has a location in New Brunswick, N.J.
Another ground-floor commercial space, at 189 State St., will be occupied by Forstone’s own management office, which will move from its current location on Fairfield Avenue. Tenants are not confirmed for the two remaining spaces, at 899 Main St. and the former location of The Backstroke on the ground floor space of the apartment building. The chiropractic and wellness business remains at its current location at 37 Markle Court, where it relocated before the renovations began. It’s not clear whether it will remain at that location. Wilderman noted Forstone is speaking to a potential tenant for the Main Street site, which has stained glass windows on the ceiling. “We have a couple of potential uses there; one is a distillery that would produce and sell their product there,” Wilderman said. Final decisions about those spaces will be made in the coming months, he added. For years, progress on downtown’s revitalization has centered on Phil Kuchma’s Bijou Square development on Fairfield Avenue, the rehab of the Citytrust and Arcade building on lower Main Street and development on the Downtown North properties along the outer edge of the downtown. The State Street properties are not the first project along the green that Forstone has taken on, nor will they be the last. Several years ago the company completed a renovation of the former Mechanics & Farmers Bank and the adjacent building, converting the structure on the corner into 30 apartments known as the Landmark apartments, and renting out the bank space to the Fletcher Thompson architectural firm. Forstone also owns the former Board of Education building, one block over from the Mechanics & Farmers Bank building on Main Street. Wilderman said plans for that building are still being formulated. “We’ll see where the demand is,” he said. The building is now empty, as is McLevy Hall, the historic building directly adjacent to the green. That building, however, is city-owned. Gill said he expects interest in McLevy Hall to increase with the completion of Forstone’s State Street projects. “Obviously that building is special and needs to be preserved,” he said. Bill Coleman, Bridgeport’s deputy director of planning and economic development, said McLevy Green is a “tremendous asset” in the downtown. The space is now the site of the seasonal farmer’s market, and the Downtown Thursdays concert series held there over the last several years have proven to be a popular draw. Some festivals and parades, including the annual Juneteenth celebration, have also used the space over the years. “The focus on the green is starting to attract more investment downtown,” Coleman said. Gill said the introduction of the beer hall and comedy club will only serve to enhance people’s perceptions of the downtown and the offerings to visitors of the nearby arena and ballpark. “The options are increasing to come and stay,” he said. With all of their projects, Wilderman said Forstone has two goals. “Our objective with that (area) is to find uses that the local Bridgeport residents want and find useful and exciting, but who new customers to the Bridgeport area will be interested in (too),” he said. In early 2013, 9 W. Broad St. on the edge of downtown Stamford languished as an empty and neglected property. Today, it hums with activity as some 400 workers stream in and out of a refurbished nine-story structure. Stamford and other communities in southwestern Connecticut still grapple with office vacancy rates hovering above 20 percent. But the revitalization of 9 W. Broad St. and the turnaround of similar buildings show how property owners’ capital investments and the draw of central locations can make corporate hubs attractive to tenants in a challenging market. Forstone Capital and Westport Capital bought 9 W. Broad St. for $14.5 million in March 2013. 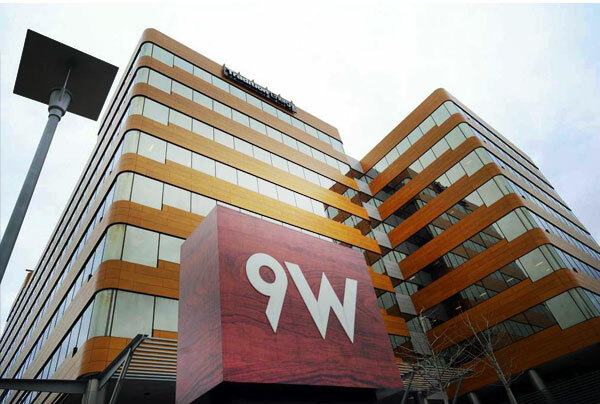 Built in the early 1980s for the Nine West shoe company, the occupancy rate in the approximately 202,000-square-foot building declined as major tenants, including Nine West, relocated. A lack of upgrades hindered the recruitment of newcomers. The new owners quickly brought in commercial real estate firm Rhys as their broker to lease and market the building. Sensing the property’s potential, Rhys then moved its own offices to the building. To make the building competitive again, Forstone Capital and Westport Capital have invested more than $20 million in exterior and interior improvements, including office buildouts, according to Bangert. The improvements have encompassed roofing, elevator and mechanical systems, the creation of a front plaza and cul-de-sac and “skinning” work that gave the building exterior its distinctive tan-brown hue. In addition, the owners installed amenities including a cafeteria, gym, conference center and private boardroom. The building’s overhaul has spurred a cascade of leasing deals. To date, Rhys has brokered 25 leases at 9 West Broad, which stands across the street from Mill River Park. Tenants now take up about 80 percent of the building, with the list of occupants including technology, health, energy, real estate and finance firms. In Norwalk, the i.Park Norwalk complex at 761 Main Ave., on the Wilton line, stands out as another revived property. In redeveloping the historic Perkin Elmer headquarters, Greenwich-based National Resources drew L.A. Fitness into a new auxiliary building at i.Park Norwalk to provide a major amenity for tenants, while populating the main headquarters building with a number of health clinics affiliated with Norwalk Hospital. And in 2013, the developer claimed the figurative yellow jersey after the Cannondale Sports subsidiary of Dorel Industries chose i.Park Norwalk for its own headquarters, relocating from Bethel to occupy both the main building and a smaller outbuilding in the rear. In Greenwich, Greenwich Office Park has also seen its outlook improve in recent years. Built in the 1970s as the headquarters for UPS and later a campus-style office option for a number of companies, it fell victim in recent years to its aged look and an “end-zone” location in western Greenwich. High vacancy rates plagued the office park, so the property’s managers Clarion Partners and CBRE Group opted to invest millions in renovating the buildings’ interiors and landscaping. The renovations culminated in a sale last fall to Greenwich-based Fareri Associates at about $344 per square foot. The deal ranked as the largest Greenwich office sale in five years, according to CBRE. In Milford, the former Smiles Amusement Center property on the Boston Post Road, near the Connecticut Post mall, sat vacant for roughly four years after the entertainment center closed in 2011. The old teen hangout was demolished in 2015 and last year was replaced with a brand-new plaza with tenants including REI Co-op, a Verizon store and Panera Bread. In Danbury, the Lee Farm Corporate Park has flourished since Southport-based Summit Development purchased the 215,000-square-foot building in 2013. Lee Farm was about 70 percent leased when Summit purchased the building for about $17 million. The building has hit 100 percent tenancy, even after withstanding the departure of GE Capital, which was spun off by its corporate parent in 2015. Wells Fargo acquired some of GE Capital’s assets and promptly leased 71,000 square feet in Lee Farm. It recently completed building out its space at Lee Farm. Rhys executives said they plan to bring in a number of new tenants this year at 9 West Broad St. Another 7,000 square feet to 10,000 square feet could be leased in the next couple of months, according to Bangert. The asking annual rate for 9 West Broad’s tenants is $34 per square foot. For a firm with 5,000 square feet, the annual outlay would come to $170,000, not including electrical costs. 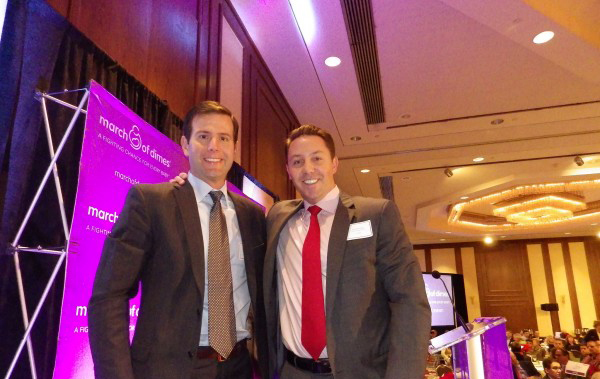 Brett Wilderman, left, and Brandon Hall, event honorees and principals, Forstone Capital. The 20th annual March of DimesFairfield County Real Estate Award breakfast drew a packed-house crowd of 700 to the Hilton Stamford Hotel & Executive Meeting Center recently. Forstone partners and co-founders Brandon Hall and Brett Wilderman were the event honorees. Since Forstone’s founding in 2007 the New Canaan boyhood friends’ company has acquired more than 1.2 million square feet of real estate. Its services include property management, asset management, construction and leasing. The breakfast’s top sponsors were The Ashforth Co., which was the event’s inaugural honoree and which additionally provided this year’s marketing and management support; Building and Land Technology, the 2003 event honoree; and Forstone Capital. A Who’s Who of county companies filled out the gold, silver, bronze and “Fund the Mission” sponsorships, 60 in all. The top donation by text won a three-course lunch and cooking demonstration for up to 15 persons with Chef Stephen Lewandowski at Harlan Publick in Norwalk. “The Real Estate Award Breakfast honors outstanding individuals or companies whose commercial real estate activities have significantly enhanced the local community,” March of Dimes said in a prepared statement. “We are proud to recognize Forstone for their area revitalization efforts and applaud their principals for their leadership and community advocacy,” said Ed Tonnessen, chairman of the Real Estate Awards committee and executive managing director at Jones Lang LaSalle. Stamford Mayor David Martin offered an upbeat appraisal of the host city’s health, noting citywide unemployment had fallen from 5.1 percent a year ago to 4.1 percent now. He cited $6 billion in construction now underway and an apartment occupancy rate of 96 percent. “The reason our rents are so high is because our occupancy rates are astronomical,” he said. Martin ticked off a number of scientific breakthroughs – the theory of relativity, the development of penicillin and the polio vaccine – and said March of Dimes progress is fueled by science. “I take it as a great disappointment that ignorance of science is seen by some as a way to be more popular today,” he said. March of Dimes will honor Forstone Capital with its 2015 Real Estate Award at its 20th annual March of Dimes Fairfield County Real Estate Award Breakfast, the organization said recently. Forstone partners and co-founders Brandon Hall and Brett Wilderman were slated to accept the award at The Hilton Stamford(One First Stamford Place) on Thursday, December 3, at 8 a.m.
More than 700 industry professionals were expected to attend the event. Prior to starting Forstone Capital, Wilderman was director of acquisitions for HEI Hospitality, a real estate firm that specializes in acquiring and managing hotels throughout the U.S. 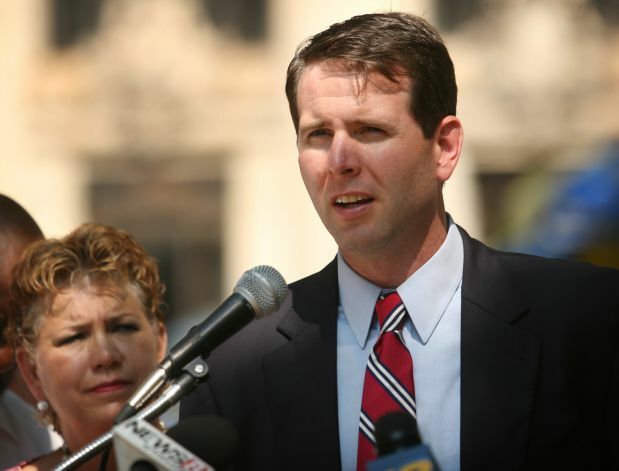 Currently, he is a board member of Stamford Downtown Special Services District. Before co-founding Forstone Capital, Hall was a senior associate for GE Commercial Finance Real Estate. He focused on developing equity partnerships with national and local operators and helped acquire a $2.5 billion portfolio during his time at GE. He is currently commissioner and vice chairman of the Bridgeport Downtown Special Services District and is a board member of the Cornell Baker Program in Real Estate. After the coldest February on record for Bridgeport, everyone is discussing two major issues: global climate change and the cost of energy. Luckily, for commercial, industrial and multifamily property owners, the Connecticut Commercial Property Assessed Clean Energy’s (C-PACE) launch of Green Bank just two years ago has helped more than 90 property owners “go green,” and the benefits can be seen here in Bridgeport. Forstone Capital, a Darien-based real estate investment firm whose principal Brandon Hall was recently featured in a “Bridgeport Better Every Day” advertisement, has been taking advantage of C-PACE funds from the Connecticut Green Bank to renovate a 98,000-square-foot office space at 855 Main St.
With this partnership, Forstone was able to garner about $2 million to finance HVAC upgrades, new cooling towers and energy-management measures that will bring in more than $6 million in savings over the life of the upgrades, according to the Connecticut Green Bank. 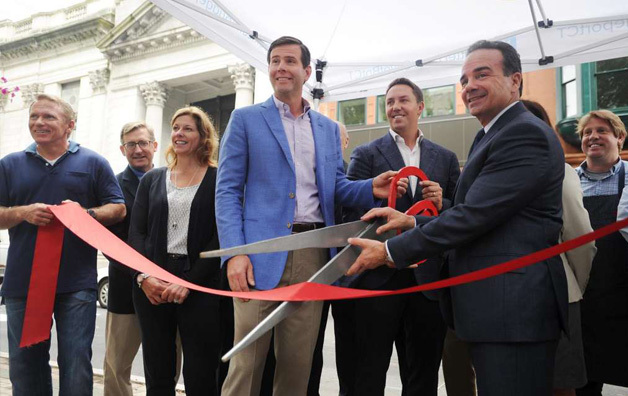 Forstone’s success in Bridgeport is just one of many projects that Connecticut Green Bank CEO Bryan Garcia was happy to announce at the two-year mark of the organization's quick start and growth. The City of Bridgeport has also done its part in making sure information on C-PACE and “PACE” funding are readily available through their website for Bridgeport business owners. The push for a greener industrial, commercial and residential Connecticut comes as the industry has allowed from more financially sound upgrades, according to Garcia. Once people move in, they need something to do. Downtown Bridgeport has seen a wave of conversions of unused buildings into apartments, introducing a downtown constituency to a neighborhood that a decade ago was mostly devoid of life. As more apartments come on the market, the next phase of growth is developing service and entertainment options for all those new residents. A few are in the offing. Forstone Capital, a Darien-based real estate investment firm with numerous holdings in downtown Bridgeport, has announced plans for a pair of new businesses aimed at both residents and visitors -- a German beer hall in the original People's Bank building at 155 State St., and a comedy club in the former Playhouse on the Green theater at 167 State St.
"We're bringing in more residential, but also entertainment options," said Brett Wilderman, principal at Forstone. "We think those uses hit home on the character of downtown, and provide services for customers in the neighborhood but also serve as regional draws." The buildings are part of a collection of properties that Forstone and Norwalk's Spinnaker Development bought from People's United Bank, based downtown, in 2008. The 60,000-square-foot, four-building Forstone development fronting on McLevy Green is scheduled to be fully developed next year. The future beer hall was for years the home of Roberto's restaurant, which closed in 2010 after 17 years in business. Playhouse on the Green, which closed in 2011, is slated to be the home of The Stress Factory comedy club, which also has a location in New Brunswick, N.J. The building next to that will be converted into 32 apartments with ground-level retail. "The buildings have tremendous history and character, and we're trying to bring them back to life here with uses that are sustainable," Wilderman said. Most successful downtown redevelopments follow a familiar pattern, said John Simone, president and CEO of the Connecticut Main Street Center, a Hartford-based nonprofit agency that helps communities facilitate downtown development. "The classic downtown revitalization is when you first have the pioneers coming to live downtown, and as that critical mass builds, you're able to support retail, small businesses, coffee shops," he said. "It's incremental and it evolves." While it can be hard to attract people to live in a neighborhood with few services, it's much more difficult for businesses to sustain themselves without a dependable customer base. "There's no simple formula, and it's really an organic process," he said. National retailers have specific requirements about the number of local residents required before they will consider moving into a neighborhood, he said. "If you don't reach those numbers, they won't even bother," he said. "If you reach it, maybe they'll take a look." It's important to think local first, Simone said. "You want to look to local entrepreneurs," he said. "Look at businesses that are already there, and see if there are ways for them to expand their product lines to accommodate people moving in. It's a local phenomenon, and not every store has to appeal to every target market." A grocery store has long been considered a classic sign of a neighborhood's arrival. In 2013 a 7,500-square-foot market with separate grocery, deli, bakery and cafe sections opened in the Arcade on Main Street, but closed six months later. "A grocery store is a milestone if it stays," Simone said, and attracting a major grocery store is difficult. "You need to hit very specific numbers before they'll even talk to you," he said. "They operate on the thinnest of margins." He said Bridgeport's continued growth downtown is a sign of unmet regional demand for that style of living, and that businesses will follow the people. As the economy slowly improves, more commercial real estate executives are looking to develop assets and deploy capital in secondary markets to generate returns, and the Greater Danbury market is providing opportunities. Of the 100 senior commercial real estate executives surveyed in a 2014 Commercial Real Estate Outlook Survey conducted by tax advisory firm KPMG, 68 percent expect to increase capital spending in 2014, up from 60 percent in 2013. Interest in the Danbury area is increasing, according to Felix Charney, president and CEO of Fairfield-based Summit Development, but available properties are at a premium. Charney faced stiff competition when he sought to purchase Lee Farm, the 215,000 square-foot office complex in Danbury last year. "There was an investment fund from White Plains, N.Y., that put it under contract, but they dropped out," said Charney, who has developed more than 3.75 million square feet of commercial space and more than 950 residential units. When Summit and its partner, The Grossman Cos., of Quincy, Mass., bought Lee Farm in April 2013 for $16.9 million, a third of the building was vacant. "We've leased 50,000 of the 71,000 square feet. We'll soon be at 95 percent occupancy," he said, adding that Danbury commercial properties are becoming attractive to prospective investors as available lower Fairfield County properties are snapped up. "Danbury is the next ring of the circle. Coastal Fairfield County is expensive, so people move to the north or east." Charney has learned to see potential in under-valued or distressed properties that require adaptive re-use of a building or brownfield site. "I'm in the business of manufacturing land. That's a term I use all of the time. I have to buy tainted assets," he said. "We're land-constricted (in Fairfield County) and have restrictive zoning. As a result, land prices are high, and it ultimately curtails supply." While the KPMG survey is revealing, because it is on a national scale it does not tell the whole story about commercial real estate investment at the regional level, according to Charney. "You can't apply macro-economics to real estate," he said, because commercial real estate is local. Like Charney, Joe Wrinn, a broker with Goodfellow Ashmore, a commercial real estate firm in Danbury, has followed the area market for nearly 25 years, said the commercial real estate market in northern Fairfield County is constricted. "There's only so much institutional-grade investment property to go around," he said. "I always have calls from people wanting to get into the investment arena. The demand for those income-producing properties is always high -- starting at $1 million. There's an awful lot of demand, but very limited supply." Most owners of prime commercial property in the Danbury area prefer to retain their holdings because they are income producers, Wrinn said. "Where else are they going to put their money," he asked. The limited supply of available Class A office space in the county is causing investors to look a Class B office properties, said Mary Grande, a Stamford-based partner in KPMG's Metro New York Financial Services tax practice. "Leasing activity has improved in Fairfield County," she said, "and there is a shift toward foreign investment in the market." Much of the interest can be attributed to the region's proximity to New York City where premium office space in Manhattan is reaching capacity, she said. The KPMG study shows that 80 percent of executives expect foreign investment in U.S. real estate to increase. Roughly 40 percent of those respondents predict non-U.S. investment to climb by 6 to 10 percent, while 8 percent expect an increase of more than 20 percent. "We've seen a substantial amount of Chinese capital deployed in 2014, and we expect that trend to continue as real estate funds, large institutions and foreign investors look for direct and indirect investment in real estate equity and real estate debt because of the attractive yields," said Phil Marra, leader of KPMG's National Real Estate Funds. When asked to identify regions with the best real estate investment opportunities, almost half the respondents in the KPMG study chose the Southeast (48 percent, up from 28 percent in 2013). The Northeast ranked fourth, behind the Southwest and Midwest with 30 percent of participants saying it offered the best real estate investment opportunities -- down from 36 percent in 2013. When asked which types of properties their company would be looking to acquire or invest in, Class A assets in primary markets led the list, followed by development opportunities, distressed assets, Class A assets in secondary or tertiary markets and Class B/C assets. BRIDGEPORT -- Nearly shouting to be heard over the buses and the music festival across the street, city and state officials Thursday unveiled what they hope with be the cornerstone of the city's downtown renaissance -- 30 luxurious but affordable apartments and a voluminous office space. The project is aptly named Landmark because it has risen from the hulking landmark Mechanics & Farmers Bank building that has sat empty on Main Street opposite McLevy Green for a decade. And it is another jewel in the crown of Norwalk's Forstone Capital, which already owns -- by itself or with partners -- a dozen downtown buildings. "When Brett (Wilderman) and I first looked at this building in 2008 it was even difficult to walk into, it was in such bad shape," said Brandon Hall, principal partner in Forstone. But shortly thereafter, the city put the three-story, block-wide building on the market and Forstone snapped it up for about $500,000. A big boost came when Fletcher Thompson, an engineering design firm with 60 jobs that had left Bridgeport for Shelton in 2002, agreed to rent out the cavernous first floor of the building. Forstone Capital was then awarded $3.3 million for the renovation project from the state through the Competitive Housing Assistance for Multifamily Properties initiative administered by the state Department of Economic and Community Development. The federal Environmental Protection Agency paid for much of the cleanup after the building was declared a federal brownfield. "There are great bones in this city and sometimes it takes people from outside with fresh eyes to see it," said Mayor Bill Finch. While Fletcher Thompson's employees will still have to wait a month or more to move into their new digs, Hall said they already have security deposits for 24 of the 30 apartments with some residents expected to move in by the end of the month. 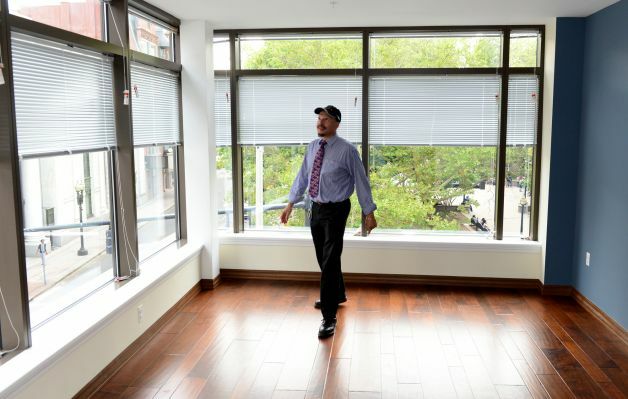 "We are showing the demand is here for people to live in downtown Bridgeport," he said. The apartments, on the second and third floors of the building, are either one bedroom or large studios ranging from 700 to 1,000 square feet. Depending on the size, the rents range from $1,050 to $1,300 with the higher-end apartments including small washers and dryers and spectacular views of McLevy Green. Designed by Fletcher Thompson, the floors are a combination of carpeting and wood panels and the kitchen countertops are granite. Parking is catch-as-catch-can, either on the street where it's free after 5 p.m. or at several of the Forstone-owned lots nearby. All are at renters' additional expense. Hall said many of the people who have made commitments to take the apartments commute to jobs in Stamford and New York. "I love it, the more the better," said Massimo Tabacco, owner of nearby Amici Grill, as he stood at the back of the crowd for the ribbon cutting. "I've been here five years and I'm starting to see more people coming downtown. The more people living downtown the better." Forstone, which set its development sights on the city in the mid 2000s, buying up with Norwalk partner Spinnaker Real Estate 10 downtown properties formerly owned by People's United Bank, has come under some criticism in the past for allegedly muscling out small businesses. The former owners of Take Time Cafe on State Street accused Forstone of forcing them out after taking over the building by doubling the cafe's rent. The Playhouse of the Green also closed after Forstone raised its rent after buying the building. And then there was Forstone's effort to force the venerable Ralph N Rich's out after Forstone and Spinnaker purchased the restaurant's building from People's. A Superior Court judge blocked that effort for now. But fellow downtown developer Phil Kuchma contends Forstone is very good for the city. "I think it's great they are investing here," he said. "It helps validate that there are reasons to develop in this city and we should be encouraging investment in the city from outside money." Washington Trust's (Nasdaq:WASH) Commercial Real Estate Group recently provided $2.76 million to Forstone Capital, LLC to finance the acquisition of a single-tenanted retail property in Westport, CT. The property, currently occupied by Men's Warehouse, consists of 6,843 square feet of retail space. Constructed in 1989, the building is situated on a .64-acre parcel with high-visibility frontage along the densely populated commercial and retail area of Westport. "Westport has one of the lowest retail and office vacancy rates in Fairfield County," said Joseph J. MarcAurele, Washington Trust Chairman and Chief Executive Officer. "Forstone Capital's acquisition of this property will benefit from the property's excellent location in this strong retail market." Forstone Capital, LLC is a boutique real estate investment firm headquartered in Darien, CT. Since its inception in 2007, Forstone Capital has acquired over 1,000,000 square-feet of office, retail and multi-family properties throughout Connecticut. Washington Trust's Commercial Real Estate Group provides commercial real estate mortgages for the construction, refinancing, or purchasing of investment real estate projects. Financing ranges in size from several hundred thousand dollars up to multi-million dollar projects. For more information, contact Timothy M. Pickering, Senior Vice President, Commercial Real Estate Group, at 401-348-1482 or 800-475-2265 ext. 1482. A Fairfield County partnership has acquired a Stamford office building and plans to spend $7 million to upgrade the property. Darien-based Forstone Capital teamed with certain funds managed by Westport Capital Partners in Wilton to buy a 200,000-square-foot building at 9 W. Broad St. According to documents at the Stamford Town Clerk's office, the seller was LBUBS 2000-CF River Plaza, a unit of LNR Partners in Miami Beach, Fla. The purchase price was listed at $14.5 million. The new owner plans to reposition the property by overhauling the building's roof, lobby, common areas, elevator cabs, amenities, entry points and mechanical and heating, ventilation and air conditioning systems. "Our vision is to reintroduce this asset to the market as a true Class A office building once the renovations are complete," said Forstone Principal Brandon Hall, citing the location in the city's central business district. "It's in a continually improving area." Forstone has 14 properties in Bridgeport and one each in Darien, New Canaan and Westport. This is its first in Stamford. "Stamford is a very competitive market. We've had our eye on Stamford for a while," Hall said. The team has engaged an architect to produce concept drawings, said Forstone Principal Brett Wilderman. "We are anxious to get started on transforming the building into something that the city of Stamford will be proud of and one that our future tenants will enjoy," he said. The project coincides with the unveiling of the Mill River Collaboration, whose Phase I stage is set to open this spring. Along with an ice skating rink and fountain, other amenities will include a carousel, fishing piers, kayak launch and a wooden canopy covering the park's central walking path. Forstone and Westport Capital are making a significant capital investment in the building, strengthening the field of Class A downtown office space, said Laure Aubuchon, the city's director of economic development. "It's a testament to the power of the Mill River. It's a park in their own backyard," she said. The location of the building provides panoramic views of Mill River Park and Stamford's central business district, said Stephen Woodard of Westport Capital Partners. Tenants can enjoy the park and walk to downtown amenities and the train station. 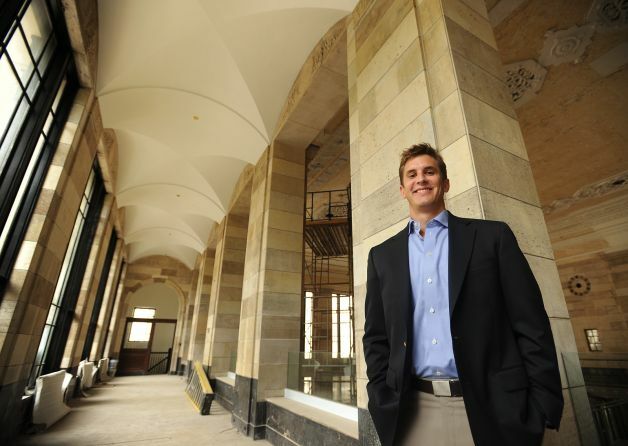 RHYS Commercial of Stamford will market and lease space in the nine-floor building, which has the American Institute of Foreign Study as its major tenant. AIFS, however, plans to relocate elsewhere in the area. 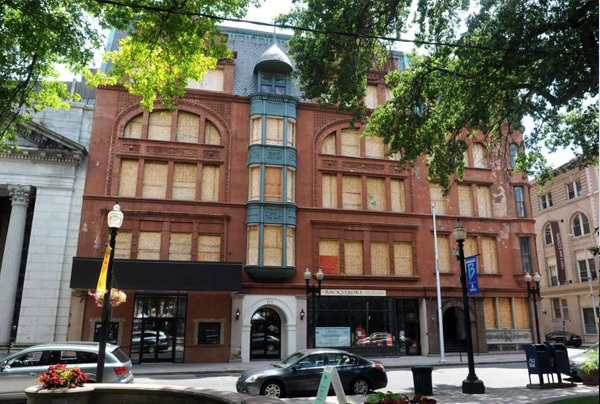 "9 W. Broad St., will be one of the premier assets in the market when the renovations are completed," said Cory Gubner, president and chief executive officer of RHYS Commercial. 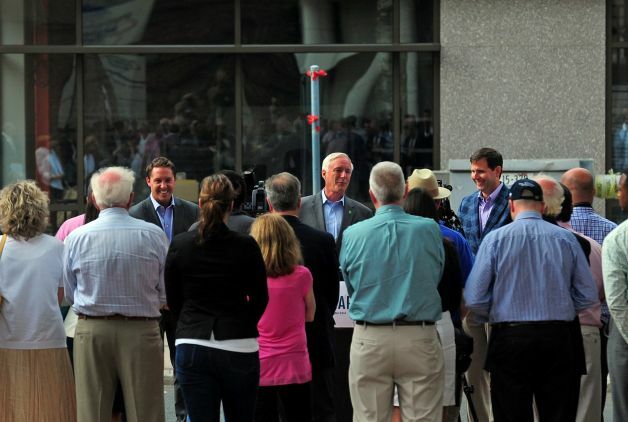 "This is the most exciting thing to happen to the Stamford office market in a very long time." He touted the building's proximity to Mill River Park and its access to Interstate 95 and the Stamford Transportation Center. The per-square-foot rental rate will be in the high $20s. "We think it's extremely competitive pricing wise. It will be a Class A building in every stretch of the word," Gubner said. RHYS already has several interested prospects, said Christian Bangert, senior vice president and principal of RHYS Commercial. "Our goal is to be able to offer prospective tenants a Class A office environment at Class B economics," he said. A joint venture comprised of Forstone Capital LLC and certain funds managed by Westport Capital Partners LLC has purchased 9 West Broad Street, a 200,301-sq.-ft. office property located in Stamford, Conn.
HFF marketed the REO property on behalf of the seller with Jose Cruz and Andrew Scandalios, both senior managing directors, Kevin O’Hearn and Jeffrey Julien, both managing directors, and Steve Simonelli, associate director, representing the seller. Situated on nearly three acres, the property provides access to Interstate 95, Route 1, Merritt Parkway, the Stamford Metro North commuter rail station and Stamford Town Center. Standing nine stories tall, 9 West Broad was renovated in 1999 and anchored by American Institute for Foreign Studies. Amenities at the property include a cafeteria and parking garage. Forstone Capital, in partnership with CapRok Real Estate, today announced its acquisition of 1365-1391 Post Road East, a retail property in Westport, CT consisting of two buildings and nearly 50,000 square feet of space. The property, located along one of Fairfield County’s most heavily trafficked retail corridors, is an easily-accessible shopping destination featuring over 750 feet of frontage, three surface parking lots, and covered garage parking, all in a highly desired neighborhood. 1365-1391 Post Road East is a top-tier retail location with longstanding tenants and considerable further potential. Over 22,000 cars pass by the property every day due to its prime spot along Westport’s Route 1 and short distance from Interstate 95. The property’s two buildings house popular retail destinations: 1365 Post Road East is occupied by Anthropologie and Parc Monceau, while Balducci’s Market calls 1391 Post Road East home. Both Anthropologie and Balducci’s have been tenants for nearly two decades, serving as enduring commercial cornerstones within Westport’s thriving retail community. Bruce Wettenstein, SIOR, and David Fugitt, SIOR, Partners at Vidal/Wettenstein Commercial Real Estate, served as the sole agents involved in the transaction. Shem Creek Capital of Wellesley, Massachusetts provided third party debt financing. Counsel for the seller was Jamie Gerard of Nevas, Capasse & Gerard of Westport. Counsel for the purchaser was Howard Komisar of Berkowitz, Trager & Trager, also of Westport. “This is an outstanding investment from a business standpoint and an irreplaceable piece of real estate,” said David Fugitt, Partner with Vidal/Wettenstein. HARTFORD -- Ten affordable housing developments worth more than $263 million were among the first recipients of a round of competitive state grants and loans announced Thursday by Gov. Dannel P. Malloy. The multifamily developments, representing 1,018 units -- with at least 367 to be leased at below-market, affordable rates -- include three in Bridgeport and one in Norwalk. Most of the projects are eligible for up to $5 million each in state support. It's part of a 10-year, $500 million effort to foster so-called workforce affordable housing throughout the state that was previously approved by the General Assembly. The state money is designed to bolster private financing for the projects. Malloy made the announcement during a noontime news conference in the Legislative Office Building. "The entire state's investment between 2000 and 2010 was $200 million," Malloy said. "Our administration has made an unprecedented commitment to affordable housing. Affordable housing is integral to stimulating economic develop and growing jobs. We invest in our cities and make them better places to live and work." In Bridgeport, the South End Community Building Initiative will develop nine units worth $1.2 million, and Urban Green will build 87 units in the Jayson/Newfield development, worth $31.5 million, said Bridgeport Mayor Bill Finch. The state is targeting $5 million to the Urban Green project. 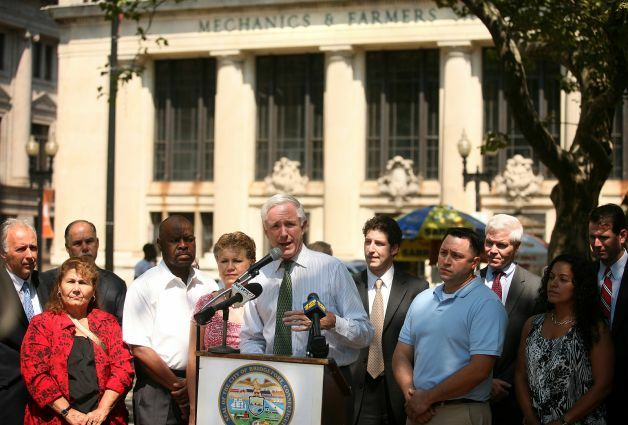 Bridgeport Mayor Bill Finch announces that three city affordable housing development projects, including the Mechanics & Farmers bank building, received state grant money, on McLevy Green in downtown Bridgeport on Thursday, August 2, 2012. Brett Wilderman of Forstone Capital, owner of the Mechanics & Farmers building that is receiving state development dollars, on McLevy Green in downtown Bridgeport on Thursday, August 2, 2012. Brandon Hall of Forstone Capital, owner of the Mechanics & Farmers building that is receiving state development dollars, on McLevy Green in downtown Bridgeport on Thursday, August 2, 2012. Also, Forstone Capital will obtain about $3.3 million to state support for its $16.2 million project to create 30 units at the former Mechanics and Farmers Bank building on Main Street. Finch, during a news conference Thursday afternoon on McLevy Green, directly across from the Mechanics & Farmers building and within walking distance of the other two projects, said the state money is a crucial piece of their financing. Brandon Hall, of Forstone Capital in Darien, said if the state support had not come through, "We don't know what we would have done, to be honest" in finishing the Mechanics & Farmers conversion. David Kooris, the city's new economic development officer, said the Mechanics & Farmers proposal in particular is crucial to the continued revitalization of Bridgeport. Fletcher-Thompson Inc., an engineering and design firm that was founded in Bridgeport in 1910 and left for Shelton in 2002, will design and oversee construction then lease space in the former bank. 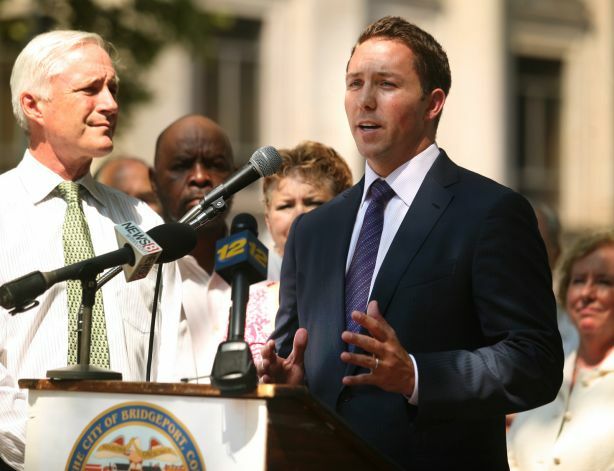 "The anchor tenant sends a signal to the world Bridgeport deserves another look," Kooris said. And Kooris said the new housing, 18 units of market-rate and 12 units of affordable housing based on tenant income, is key to bringing more pedestrians downtown to support emerging businesses and entertainment. "These are units occupied by young professionals priced out of Stamford and Norwalk," he said. Elizabeth Torres, executive director of the Bridgeport Neighborhood Trust, said that group's South End Community Building Initiative is key to reclaiming an eight-block area filled with foreclosed upon homes and properties on the brink of foreclosure. "It's part of a larger neighborhood stabilization strategy," Torres said. Finch said he appreciated the effort because he used to live in the South End. In Norwalk, the 34-unit River Commons apartments on School Street will receive funding as part of its overall $10.4 million renovation of the property. Catherine Smith, commissioner of the state Department of Economic and Community Development, told reporters that about $80 million in long-term bonding already has been approved for the housing program. 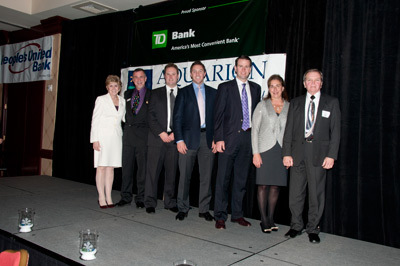 On Wednesday, December 14, 2011, Forstone Capital, LLC was the proud recipient of the Economic Development Regional Impact Award from the Bridgeport Regional Business Council. Forstone Capital was recognized for its outstanding performance in Economic Development, one of the five priorities designated by the Business Council. The award was accepted on behalf of Forstone Capital by Brandon Hall and Brett Wilderman, Principals. 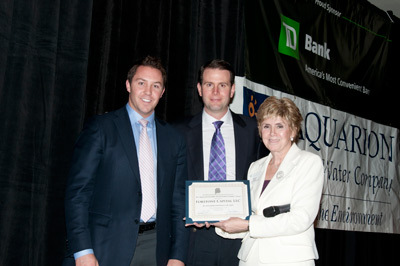 Brandon Hall and Brett Wilderman accepting the 2011 Economic Development Regional Impact Award. Building and Land Technology is continuing with its goal to make its Harbor Point project in Stamford a multi-use community, announcing the arrival of Le Pain Quotidien, a Belgian bakery-cafe, and Harlan Social, a gastropub. Both are scheduled to open in May in the Yale & Towne neighborhood, with Le Pain Quotidien located at 711 Canal St., and Harlan Social at The Lockworks, 121 Towne St. The arrival of the restaurants enhances the 80-acre project's "live, work and play" lifestyle, said Carl Kuehner III, chief executive officer of Norwalk-based Building and Land Technology. "With its neighborhood focus, creativity and uncompromising standards of quality, Le Pain Quotidien is the perfect addition to Harbor Point," Kuehner said in prepared comments. "Harlan Social adds yet another exciting dimension to Harbor Point's concept of cosmopolitan living." Stephen Lewandowski, executive chef of the Tribeca Grill in New York City and operator of Harlan Social, has a wide breadth of international experience and culinary knowledge that will make the restaurant a community destination, according to Kuehner. "In a relaxed and inviting atmosphere, Harlan Social will be a lively gathering place for people to socialize and enjoy good food and drink that is intriguing but not intimidating," Lewandowski said in prepared comments. Guests can view the open kitchen and "action station," and there will be a full-service outdoor dining area. The restaurant will also offer cooking demonstrations. Founded in Belgium, Le Pain Quotidien will offer freshly baked organic bread, organic beverages, European-style pastries, Belgian waffles, salads and tartines and quiches. Le Pain Quotidien has restaurants in Greenwich, New Canaan and Rye, N.Y., and had been looking at downtown Stamford, said Lauren Goldblatt, director of real estate. "When we were introduced to Harbor Point, we were very impressed. We saw a synergy between the shoppers at Fairway and our customers," she said, adding that she liked the businesses that already have arrived. They include Starwood Hotels & Resorts Worldwide, Design within Reach, Cornell University Veterinary Specialists, Louis Dreyfus Highbridge Energy, First Niagara Bank exhale Spa, Go Green Dry Cleaners, Dinosaur Bar-B-Que, Subway and Robeks Premium Fruit Smoothies, as well as Fairway. The bakery-cafe will be one of several businesses at the century-old building that once housed the Yale Lock factory. With about 2,800 square feet and upwards of 40 employees, Le Pain Quotidien is strategically located to serve residents of The LockWorks and The Lofts at Yale & Towne and nearby businesses. That's the premise of a mixed-use development with restaurants, shops, offices and other businesses, augmented by open space, said Anita Kramer, vice president of the Urban Land Institute's Center for Capital Markets and Real Estate. "You have a place to relax, stroll and do a little shopping," she said. "From a developer's side, they are providing a place for the residents, and it creates more of a destination. The arrival of Le Pain Quotidien is an indication that there is a solid market there." Harbor Point could be considered a more expansive and inclusive version of Blue Back Square in West Hartford, said Nicole Griffin, executive director of the Connecticut Restaurant Association. "The point is to have a self-contained community with everything a resident may want. It's nice to go down the street and have a meal and a drink," she said. "Each component is super important." Mayor Bill Finch introduces Michael Marcinek, of Fletcher-Thompson, Inc. in the lobby of the Mechanics and Farmers Bank building, in Bridgeport, Conn. Dec. 12th, 2011. 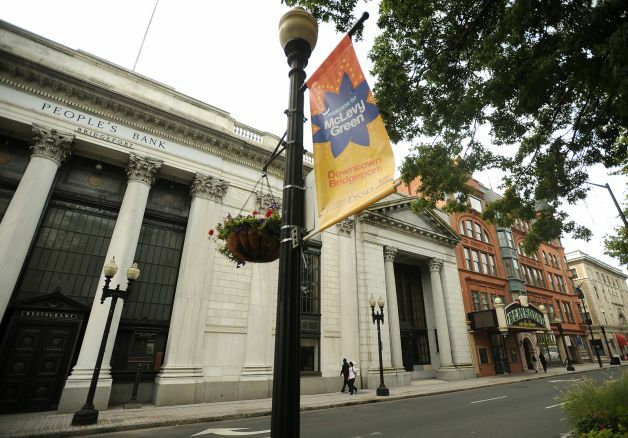 Fletcher-Thompson, a major architecture, engineering and interior design firm, announced that they will be relocating back to downtown Bridgeport, and will occupy the former bank building, that they will also be renovating. The renovation is expected to take 18 months. An engineering and design firm that left the city in 2002 will be moving back. After leaving for Shelton in 2002, Fletcher-Thompson Inc., which was founded in Bridgeport in 1910, is planning its move back to the city and will design and oversee the construction of the Mechanics and Farmers Bank on Main Street with the intent of leasing space there in January 2014. "When we left it was tough for Bridgeport, but looking back we had to make tough decisions," said Mike Marcinek, managing partner at the architectural, engineering and interior design firm. "There have been many strong ties with the city. We looked back, and we said maybe we made a mistake leaving." A decade ago, Fletcher-Thompson's 135-person workforce was spread out in three buildings in Bridgeport. After failing to locate 35,000 square feet of contiguous office space and suitable parking in the city, the company moved to developer Bob Scinto's Enterprise Corporate Park. The company occupies 30,000 square feet there. But with additional offices opened in New Jersey, Florida and other states in the last decade, the space is now too large for the 60 employees who work there. Scinto said he was surprised but not upset to learn the company plans to move back to Bridgeport. "That's so terrific," he said. "They've been a great tenant. I've used them on a couple of projects. I'm losing a tenant, but I'm so glad Bridgeport is getting them." He said he is not worried about filling the space once Fletcher-Thompson leaves. "We have people waiting for space here," said Scinto. Marcinek said the company could not pass up the opportunity to move into the historic M&F bank. He said the question became, "Do we stay where we are in suburbia or do we look to being part of the renaissance of downtown Bridgeport?" He said architects like to be in urban settings. Although the company is excited to return to the city, the move could take up to two years because of the tremendous amount of work still required to renovate the bank property, which was vacant for decades, Marcinek said. When it does happen, Mayor Bill Finch said it will be great news for the city. "It was symbolic of troubled times when Fletcher-Thompson left the city for a different venue," he said, "and it is symbolic of better times to come that they have decided to return to the city and be a participant in the revitalization of downtown Bridgeport." The company plans to lease the entire bank space, at 930 Main St., and ground floor space in the adjoining building, at 114 State St. Plans for the structures also include roughly 30 market-rate apartments in the upper floors. Maintaining the property's historic integrity -- detailed stonework will have to be replaced to its original state, for example --will require a lengthy renovation process, said Brett Wilderman, principal at Forstone Capital, which was chosen by the city to purchase and redevelop the property in 2009. "As a major stakeholder in the downtown, to have a company like Fletcher-Thompson move into downtown is a great thing," he said. "It allows us to move forward with the redevelopment and will put more feet on the street to use the retail operations." 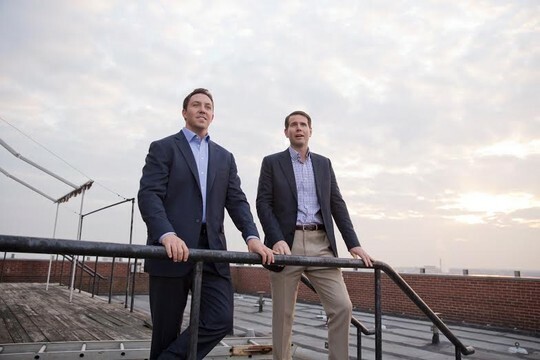 In 2004, Brett Wilderman and Brandon Hall began the planning process for a real-estate company that would purchase commercial properties in and around Bridgeport, Connecticut. The idea was to bring in revenue by either leasing up the properties or improving their operating expenses. When the firm went live in 2007 as Forstone Capital, the US real-estate market was at its frenzied peak, and the firm purchased a handful of residential and commercial properties. "It was an interesting time to start a real estate company," Wilderman says with a laugh. "We quickly faced some pretty serious challenges." When the real-estate bubble burst in 2008, the opportunity to increase rents- essential to Forstone's business model-disappeared. The firm had little choice but to shift its focus wholly toward cutting back on operating expenses. With utilities making up a large percentage of these costs, Forstone Capital quickly became acquainted with the world of sustainable building and design. "Many of the properties we owned were over 50 years old," Wilderman says. "The mechanical systems had been upgraded over the years but were often still quite old." The firm discovered that a number of programs offered grants for buildings requiring energy-efficient improvements, and it began aggressively pursuing those subsidies. At its property at 100 Fairfield Avenue, Forstone Capital was able to cut down on energy costs through a variety of measures. The controls on approximately 80 heat pumps were upgraded to direct digital controls, and Web based energy-management systems were installed on the boiler system, cooling tower, and makeup air units, allowing for more efficient oversight of energy use throughout the building. "It gives a brain to the system, heating and cooling the building only when it needs it," Wilderman says. Ultimately, the building has cut 487,000 kilowatt-hours annually and saved $100,000. Today, Forstone Capital-which now owns around 600,000 square feet of space in Bridgeport, much of it downtown office space is not only keeping an eye out for ways to improve efficiency; it's also collaborating with third-party energy-efficiency experts as part of its acquisition process. The firm outsources its HVAC maintenance to a company that possesses an in-house sustainability-evaluation team that runs analytics on different scenarios. "That awareness has really given us a leg up, both in terms of existing properties and properties we're evaluating for purchase," Wilderman says. "We've become much better at eyeing those opportunities." What, then, are the metrics for whether a potential property is viable from the point of view of improving operating expenses? "We always look at payback, and whether the up front costs can be justified through savings and bolstered by subsidies," Wilderman says. "If we're spending $100,000 to upgrade, we want to have a firm estimate on how quickly we'll get repaid on that in reduced energy costs. Two years or less is phenomenal. Three is okay. Four or more, it becomes less attractive." Though it still looks at occasional residential properties, Forstone Capital's niche is primarily commercial. "People are still pessimistic about the recovery of the commercial market, so there's less competition which we view as an opportunity," Wilderman says. "Since 2008, almost everyone's been in the position of trying to weather this economic tsunami. Before that, the idea of energy efficiency was about a tenth of our consideration with our properties. Now it's one of the biggest. It's completely shifted the paradigm." An environmental testing company has chosen Darien for its new headquarters, settling into a space at 19 Old Kings Highway South. TestAmerica, a privately owned business that has 35 laboratories and 40 service centers, opened its main office in late September in a 4,600-square-foot space in a building owned by Forstone Capital LLC. The Darien site was chosen for its proximity to senior leadership and access to transportation, according to a company statement, which noted that CEO James Hyman lives in Stamford, and Chief Financial Officer Benjamin Erwin lives in Darien. Stamford resident Constance Hubbard has been hired as vice president of human resources. Jeffrey Gage, managing principal of the Norwalk office of CresaPartners, which represented TestAmerica in its site search, said it has been operating with a virtual headquarters. "They felt they needed a home base. The idea is having a beachhead where they can recruit from," said Gage, who worked with Rich Opalenik of the CresaPartners Norwalk office. "We're managing a portfolio of $1.2 million square feet for them." Gage said the space will eventually house 15 to 20 employees. The 45,513-square-foot, three-story building, purchased by Forstone Capital eight months ago, is a block from the Darien train station and near Darien's downtown, an important location as Forstone fills the property, said George Walker, executive vice president of the Stamford office of Jones Lang LaSalle, which represents Forstone. Forstone is remodeling the building and improving the landscaping and parking lot, he said. "Generally, the occupancy level is about 50 percent, but we've had a lot of interest from companies looking to take advantage of the downtown amenities and Metro-North. Our prospect velocity has been good," Walker said, commenting that Trammochem will soon move to 17 Old Kings Highway South in Darien, and JetBlue will then finish moving to its New York offices. "That gives us the opportunity reposition the building." Carol Wilder Tamme, president of the Darien Chamber of Commerce, welcomed TestAmerica, noting that Old Kings Highway is a block from the busy Post Road. "Expanding the `business buzz' from the Post Road into another block will be beneficial for restaurants and all other businesses that support people employed in our central business district," she said. Commercial rentals in Fairfield County showed signs of life in the second quarter as vacancy rates appear to be stabilizing. In the quarter, leasing activity increased by 71.1 percent, compared with first-quarter numbers, according to the Stamford office of Cushman and Wakefield. Class A leasing activity totaled 663,442 square feet -- almost double the 346,930 square feet leased last quarter and 12.5 percent higher than the same period of last year. "Leasing activity is finally returning to the more normal levels of 2.7 million square feet per annum after hitting a low of only 900,000 square feet in 2009," said Jim Fagan, senior managing director and head of Cushman & Wakefield's Fairfield and Westchester County region. "We have clearly survived the worst part of the cycle and are in a continuing up-trend, although there will be some bumps along the way." Class A office vacancy rates range from 29.6 percent in Stamford's non-central business district and 29.1 percent in Greater Danbury to 0.7 percent in Fairfield, where there are few Class A office complexes, according to the Cushman & Wakefield report. Other Class A office vacancy levels are 20.4 percent in the Stamford central business district, 20 percent in Greenwich, 16.1 percent in Darien/New Canaan, 21.3 percent in Norwalk, 12 percent in Wilton/Weston, 16 percent in Westport/Southport, 13.2 percent in Bridgeport, 14.6 percent in Shelton/Stratford and 17.1 percent in Trumbull. Average rental rates for Class A space range from $55.53 in Greenwich and $44.17 in Stamford's central business district to $19.99 in Bridgeport. Major lease deals in the quarter included Bridgewater Associates' expansion at 20 Westport Road in Wilton, moving into 227,998 formerly occupied by Louis Dreyfus Highbridge Energy. Dreyfus relocated to new space at Harbor Point in Stamford. Other significant leases in the first half the year included AQR Capital renewal of 31,000 square feet and expansion of 27,000 square feet at 2 Greenwich Plaza in Greenwich; Telekurs' renewal of 32,600 square feet at 3 Riverbend Center in Stamford; a new lease by Wells Fargo Advisors for 25,800 square feet at 450 Post Road East in Westport; Columbus Circle Investors' expansion of 7,450 square feet at 1 Station Place in Stamford to 24,000 square feet; a new lease by Freeport Commodities, a spin-off of Sempra, for 23,000 square feet at 5 Greenwich Office Park in Greenwich; Sikorsky sublease of 168,000 square feet at 1 Far Mill Crossing in Shelton; News America renewal of 52,000 square feet at 20 Westport Road, Wilton; Nielsen Co., a new lease for 35,000 square feet on Route 8 in Shelton. Commercial agents are waiting to see what UBS decides regarding its future in Stamford, possibly impacting the office rental marketing throughout the area. "That will set a tone for central Fairfield County," said John Goodkind, managing principal at Newmark Knight Frank. "Despite rumors surrounding UBS's plans to pull out of Stamford and relocate back to New York City, financial service firms recognize the importance of maintaining a presence in Fairfield County. In fact, the services industry accounted for nearly 60 percent of the leasing volume (total square footage), including renewals and new deals, in Fairfield County during the second quarter of 2011, and nearly one-third of all deals brokered during this period. These firms are taking advantage of the competitive rates in the market to expand and locate into Class A office space." His firm's statistics showed the overall availability rate in the county decreased from 26 percent in the last quarter and 26.6 percent reported a year ago to 24.7 percent in the second quarter of 2011. Tenants and prospective tenants are taking advantage of the vacancy rates to drive deals with landlords, while some are taking less space because they have fewer employees than four years ago, Fagan said, whose firm is marketing The Financial Centre, a 561,000-square-foot vacant office building owned by Lehman Brothers Holdings at 695 E. Main St., in Stamford. Newmark Knight Frank has been the leasing agent for The Financial Centre, but has been unsuccessful in finding a major tenant. "That building needs to find an owner. They need to invest money in it. It's a great piece of real estate," Goodkind said. "We're hoping there's a ripple effect from New York City." Some investors are taking advantage of difficulties faced by some landlords to acquire office properties. Among deals done in the quarter were the sale of 1 Dock St. (90,000 square feet) in Stamford to Dock Street Holdings LLC for $15.8 million; 889 Bridgeport Ave., (55,000 square feet) in Shelton to Rugby Realty for $2.8 million; 19 Old Kings Highway South (41,000 square feet) in Darien to Forstone Capital for $7.8 million; and 450 Post Road East (35,292 square feet) in Westport to Baywater Properties for $5.4 million. "Capital is rolling back into the market," Fagan said. "After a period of virtually no sales, owners are finding that market pricing is yielding favorable results, although still well off the price levels achieved in 2007." A solid rebound in the market, however, will not occur until companies get some reassurance that uncertainty created by the federal health plan, the federal Dodd-Frank legislation regulating financial services and the nation's debt ceiling is resolved, said Robert Caruso, senior managing director of the Stamford office of CB Richard Ellis. When a surge of hiring occurs, companies will seek more space and vacancy rates will decline, he said, but there are signs of improvement. "We're not seeing any more giving back of space, which is good. We're starting to see expansion," Caruso said. "People aren't in the reduction mode anymore." Building and Land Technology is making strides in advancing its Harbor Point project in the south end of Stamford, Caruso said, but there won't be a surge in retail tenants until there are more occupants in the office and residential spaces under construction. Aside from Harbor Point, there has been little new construction in the region, and the market should slowly absorb much of the direct available space, said Cory Gubner, president and chief executive officer of RHYS, a commercial real estate firm in Stamford. "Small quarterly improvements in the office market will eventually add up to a significant turnaround, so long as unemployment begins to decline," he said. The long-awaited bump in hiring may be occurring, based on information supplied by the Stamford office of Jones Lang LaSalle, showing that office-using sectors increased employment in the county by 1.2 percent since June 2010. Total payrolls grew by more than 1,200 jobs during the first six months of 2011, and office-using jobs accounted for more than three-quarters of additional payrolls, growing by nearly 1,000 jobs. "It appears that demand-side fundamentals are starting to improve," said the firm in its /Pulse/ report for the second quarter. The trends are indicative of large, well-established companies expanding and smaller companies beginning to stabilize, the report said. $7.8 million. 19 Old Kings Highway South (between Corbin Drive and Center Street) Darien, CT. A private investment group in New Canaan, Conn., has bought this 42,376-square-foot office building with two stories and an 8,489-square-foot third-story setback. The property has 142 parking spaces and is in the downtown area within walking distance of the Metro North train station. Five years ago, Bridgeport's downtown offered little but fast-food chain eateries, marginal shops and small businesses scattered among empty, graffiti-defaced storefronts. People visited with a purpose -- their job, jury duty at the Fairfield County Superior Courthouse, shopping for clothes at Jimmy's Army and Navy Store -- then quickly departed. Since then, several of the vacant, deteriorated buildings began to gleam again, hundreds of residential units were created and new restaurants began to give people a reason to visit and, most importantly, stick around downtown. The rocky economic climate has slowed that progress significantly over the last two years. Funding sources are scarce, leaving developers to scramble to get projects -- some announced with fanfare years ago -- off the boards and into the ground. Compounding the problem is the reluctance by commercial and retail enterprises to invest in a new venture. Chosen in 2005 to transform several blighted blocks owned by the city, developer Eric Anderson, of Urban Green Builders, has witnessed the ups and downs of downtown revitalization first-hand. With Anderson's renovation of the Citytrust building at 955 Main St., the Arcade shopping mall on the next block and the 144 Golden Hill St. building, more than 200 units of housing have been added to the downtown inventory. Those projects are now 95 percent occupied, he said. Kristal Francis, who moved into the Citytrust building in September 2008 as she awaited renovations to be complete on the former Arcade Hotel, said her decision to live downtown was easy. "I went one day after work to see the (Arcade) building and knew right away that this was the next move I was going to make. I wanted to be a part of change, an urban pioneer," she said. "Once the Arcade was open and ready, I'll admit I was a little sad to move out of the Citytrust building," Francis said, "but once I saw that atrium, I started to smile again. It was nice to see that the apartments are not cookie-cutter and bland." Despite his success providing affordable, attractive housing units downtown, Anderson has found it difficult to fill retail spaces in the three buildings. "The retail market has been very tough," he said, "but everyone else has been going toward lots of vacancies and we've been slowly getting people in." So far, the Main Street Pharmacy, a Citibank branch, clothing store GumDrop Swap and eateries Amici Miei and Fraiche Burger are the only retail tenants in Anderson's three buildings. A photography studio, an ice cream shop and a cupcake store are scheduled to open soon. GumDrop Swap owner Gabby Fludd said when she saw the Arcade, "I fell in love with it and I said this is where I want to be." At GumDrop Swap customers drop off their children's clothing, collect points known as "gumdrops" for each item and use those to acquire clothing of a different size. To swap, customers must pay a low monthly fee. Years ago, the Bridgeport resident was one of the first tenants of the Read's Artspace building. "It was my first home when I moved to Connecticut," Fludd said. "I know it's safe to live and work here." To get things moving again, Anderson is working with the Connecticut Housing Finance Authority for financing to fit out retail spaces in his buildings, including a planned grocery store at the Arcade. Also, because of the issues he has faced, Anderson has decided to delay plans to build a new tower building in the Downtown North redevelopment zone, consisting of the blocks bordered by Gold, Golden Hill, Main and Middle streets and half of the blocks on either side of Main Street between Golden Hill and Fairfield Avenue. Instead, he will focus on renovating two dangerously deteriorated structures on the site that now are surrounded by concrete jersey barriers to prevent pedestrians from getting too close. He recently applied to CHFA for funding and is waiting for the agency's response. Developer Phil Kuchma knows about waiting. He has waited nearly two years to fill the gap created when the failing economy forced a major funding source to drop its backing for a mixed-use building he was building at Lafayette Circle and Fairfield Avenue. The half-finished structure has come to epitomize all the other stalled efforts to revitalize downtown. Kuchma said he expects his final funding source -- a loan from CHFA -- to be in place soon. Once that happens, construction work will move "full-speed ahead." He estimates residents could be moving in to the residential units by late fall. Kuchma said he also expects a dry clean business, liquor store and a unisex hair salon to occupy three of the seven retail spaces on the building's ground floor. They will join the restaurants already on lower Fairfield Avenue in Kuchma's Bijou Square, including Epernay Bistro, Las Vetas Lounge and Two Boots. Those eateries are doing well, he said, especially when events are held at the nearby Klein Memorial Auditorium and the Arena at Harbor Yard. "There is always additional business when there are events going on," he said. "It really changes the amount of people who come to the restaurant very noticeably." Kuchma said in recent years he has seen a lot of new faces downtown. "Most of the business that comes here is from the suburbs," he said. "Most of the time I see people I don't know. That's what I want to see." Kuchma said he also regularly gets calls from people looking for space to open a new dining spot downtown. That's music to Brandon Hall's ears. Hall, a principal in Norwalk-based Forstone Capital, has contractors working on interior demolition of the water-damaged Mechanics & Farmers Bank building at 930 Main St. "We are excited," he said. "In the state it was in, you couldn't even walk potential tenants through the building." Hall said once completed, he envisions retail, commercial and residential tenants in the once-grand stone structure. Forstone has also seen progress in the buildings the business purchased in partnership with Spinnaker Real Estate, also of Norwalk. The two companies purchased a nine-building portfolio from People's United Bank in late 2008. The building at 779 Main St. was renovated last year and now houses nonprofit Casey Family Services. The partners will also soon welcome Wholesome Wave, a nonprofit focused on nutrition, into a street level space at 189 Main St. The company is moving to Bridgeport from Westport. Despite the signs of improvement downtown, though, plenty of work remains to be done. The stretch of Main Street through northern downtown is still flanked by blighted or boarded-up buildings -- like the Poli and Majestic Theaters the city has put up for sale -- and weedchoked parking lots. Adam Wood, Mayor Bill Finch's chief of staff, said the city has started to clean up the blocks to the south of the Cardinal Shehan Center to make the area more "aesthetically pleasing" by demolishing the former convenience store building at 1290 Main St. several weeks ago. The lot will be used as a municipal parking lot until a development plan is approved for the area, said Donald Eversley, the city's economic and community development director. "We are reviewing the condition of the remaining structures on that block to determine their viability for improvement and development," he added. The city has also been assured by owners of the building that formerly housed the Azteca and Ocean Sea Grill restaurants, across the street from the shuttered theaters, that their site will not be inactive much longer as it is undergoing renovations. Wood said the city's redevelopment hopes have been slowed -- and, for years, nonexistent -- by the lack of funds for the expensive makeover of the many old buildings. But, he added, officials are confident that now that downtown revitalization has begun, nothing will stand in the way of continued progress. Three months after purchasing the former Mechanics & Farmers Bank building on Main Street, Forstone Capital is preparing to market the property to tenants. Forstone, a Norwalk-based real estate investment firm, was chosen by the city to redevelop the building at 930 Main St. and 114 State St. The company paid the city $500,000 for the property, the minimum bid requested for the site. After the bids were opened the spring, the city never publicly acknowledged that officials were negotiating a contract with Forstone and never publicly announced that the company had purchased the property. "They have 18 months from closing to commence development of their project, currently planned for a mix of commercial and restaurant uses," said Donald Eversley, the city's director of planning and economic development. Eversley said the sale would serve to enhance downtown's revitalization. "It will take a long vacant building and return it to active use, generating economic activity and taxes for the city, creating jobs and supporting other development in the downtown area," he said. Brandon Hall, a partner in Forstone, said the new owners have begun interior demolition work on the building, which he said has significant water damage. "Our immediate plans are to clean up the building. We are replacing the broken windows" this week, he said. Once the work is done the company will begin to market the building. Hall said plans for the building could include housing, but he declined to elaborate. He said the company did not want to "overpromise on what can be done there. It's very difficult in this environment to have anything done." "We want to take the building and bring it back on line, bring it back to life," Hall added. Just over a month before closing on the M&F building, Forstone also purchased the four-story office building at 100 Fairfield Ave. for $2 million. Their latest additions to the company's portfolio bring its total downtown holdings to more than 600,000 square feet of space. Last year, Forstone partnered with Spinnaker Real Estate Partners, operating together under the name of Main Street Ventures, to purchase 10 downtown properties on Main, State and Broad streets formerly owned by People's United Bank. Forstone also purchased the three buildings on Lafayette Square and Fairfield Avenue last year, where Joseph's Steakhouse is located. It recently paved the lot next to the restaurant and are now charging $1 an hour or $5 for the day to park in the lot. Drivers pay a machine at the rear of the lot and leave their receipt on their windshield as proof of payment. Similar machines are used in surface lots in Stamford and Norwalk. "It's clearly stated and we tried to make the rates reasonable," Hall said of the new fees. The company has a contract with Midtown Towing for enforcement of the fee. The $15.7MM complex, dubbed Lafayette Circle, will help play key role in the city’s revitalization. Forstone Capital, LLC, in a joint venture with Maxwelle Real Estate Group of Aventura, FL, is proud to announce the purchase of 170,000 SF of commercial space in the heart of downtown Bridgeport, Connecticut. The 3 building complex is currently 95% occupied and located in an urban-infill growth area easily accessible from I-95, Route 8 and Metro North railroad. Included in the acquisition are approximately two acres of ready-to-be-developed land adjacent to the office complex. The purchase falls in line with Forstone's investment strategy of buying properties with strong short-term cash flow coupled with value creation opportunities. Purchased in an off-market transaction through Fred Frasinelli of AMS Real Estate, Forstone was able to make the purchase at an attractive cap rate on existing income. The appeal of the property is underscored with its base of high-credit tenants and premier location within Bridgeport’s emerging commercial district. “In a time of wide spread financial turbulence, the completion of this transaction was a significant accomplishment for our company. 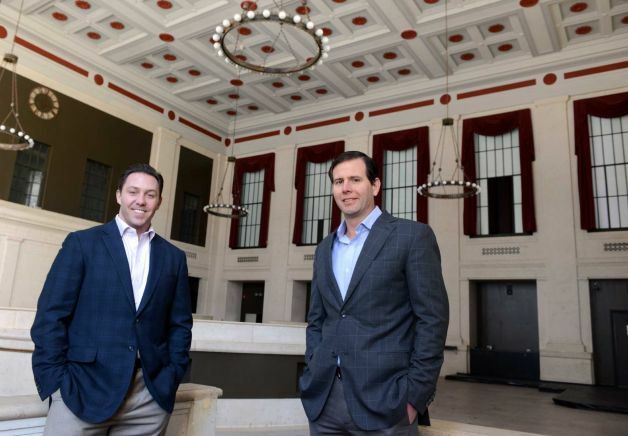 We are thrilled to be playing an active role in the revitalization of downtown Bridgeport while expanding our portfolio,” explains Brandon Hall, principal of Forstone Capital, LLC. Forstone Capital sees significant market opportunity in Bridgeport and is committed to participating in the downtown renaissance. As rents throughout the region continue to increase, many businesses are taking interest in Bridgeport to benefit from its convenient transportation infrastructure, developing urban amenities and affordability. To capitalize on this growth trend, several notable private investment firms have recently taken positions in and around Bridgeport’s commercial core with major development plans over the next several years. In keeping with Forstone’s value-creation philosophy, the company plans to make several improvements to increase the properties’ efficiency and marketability. Forstone’s expertise in leasing and property management will help to position Lafayette Circle as one of Bridgeport’s premier commercial complexes. In addition to upgrading the existing buildings, a number of strategic opportunities are being explored for the adjacent development sites. Lafayette Circle marks the second acquisition by Forstone in Bridgeport; a 36- unit multifamily apartment complex was also purchase late last year. Brandon P. Hall and Brett M. Wilderman launched Forstone Capital in April 2007 having previously worked for institutional real estate firms.